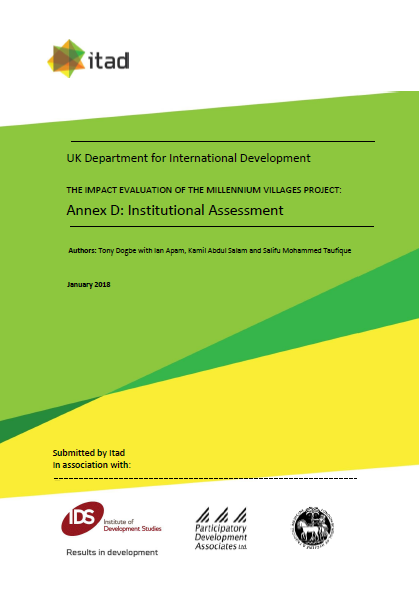 The independent evaluation of the Millennium Village Project (MVP) in northern Ghana is based on quantitative and qualitative data that was collected in three stages of the project: baseline, midline and endline. For the institutional study, the baseline aimed to understand the institutional and governance arrangements in place for the management and implementation of the MVP. The midline institutional study sought to understand how the relationships between institutions and organisations at various levels had evolved as a result of the project, and why. The endline evaluation aims to assess the impact of the project on the district and community institutions and their capacity to sustain the achievement of the MDGs. The institutional study has tended to focus on the experiences and perspectives of the MVP by district institutional actors. However, for this endline report, which is based on the institutional causal chain, the views of community members from the MVP cluster communities have also been incorporated.